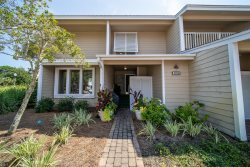 You will love to stay in this beautifully furnished 3 bedroom, 3 bathroom townhouse located in the heart of Sandestin. Located in the Sandestin Bay Resort, you are just minutes from the beach, several pools, the Village at Baytowne Wharf and the shops and restaurants at Grande Blvd. You are just minutes to every location great location in the resort. Need to pick up a few groceries? Just take a spin over to Publix and grab what you need. Need a coffee? Check out the Starbucks in Grande Blvd. The kids will love loading up at night for the park, carousel, zipline, and other activities at the Baytown Wharf Village. Enjoy morning coffee on the lovely screened porch and prepare meals the fully equipped kitchen. This unit is very spacious, sleeping up to 10 people comfortably. The upstairs has two masters with king beds. The third bedroom has a queen bed and the den has two sleeper sofas for extra space. Pet friendly for a small pet. We would love to have you in San Destin! We look forward to working with you. Please call us at 334-703-4340, if you have any questions at all. There is a sofa sleeper in the den and third bedroom. Golf:optional for additional fee, golf cart included in the rental.